Last May, Sean Spence, one of the drivers working for Sanitation Salvage fatally struck Leon Clark on East 152nd Street near Jackson Avenue in the Bronx. The pedestrian who was in his 70ies lived nearby in Adam Houses. As the police were investigating the accident they discovered that Sean Spence had killed another man with his truck less than 6 months before and that he had lied about it. Spence pretended that the man he killed in November 2017 was a homeless guy who was trying to jump on his garbage truck. He told the police that the man was trying to hold the side mirror when he fell under the wheels of the truck and died. The police later found out that Spence had lied to them and that the man killed was not a crazy homeless man but Mouctar Diallo, a 21-one-year-old off the books worker who was trying to make a few bucks in cash. Diallo was working off the books as a third man to help the driver and his main helper. Third men are often paid by the driver himself or the supervisor gives extra-cash to the driver to pay the third man. It is a common practice in the private garbage truck industry and most main helpers start this way before to be officially be on the books. Diallo had been working off the books for Sanitation Salvage for a year and half before the fatal accident and had the reputation to be a hard worker and a nice and happy person. His co-workers loved him. However after his death both the truck driver and his main helper pretended they didn’t know Diallo and that he was just a crazy homeless man. It is likely that the Sanitation Salvage managers also knew about the cover up. When the truth came out, the outrage of the public and city council members prompted the Business Integrity Commission to suspend the private hauling company’s license for a month. 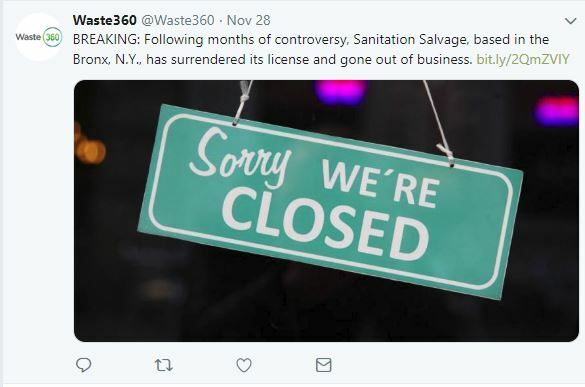 After further investigation it was found that half of the Savage Sanitation trucks had failed roadside inspections and that they had been involved in 58 crashes over the last 3 years. The Business Integrity Commission then refused to renew its license in September and the company recently announced that it was going out of business. The company which was probably the most dangerous is finally off of the streets but the other private trash hauler companies are no angels either and more needs to be done to reform the entire industry.